As the DIY movement gets a stronger and stronger foothold in the wedding planning world, I think it's important for each of us to step back and ask ourselves, "How do I personally feel about DIY? Will DIYing aspects of my wedding make me feel more connected to my wedding or will it stress me out? Is our wedding the perfect opportunity to express ourselves creatively or do I simply feel pressured because everyone else is doing it? Will DIYing help us save money or will we end up spending more once we factor in our time and energy? The answers are different for all of us. For Matt and me, the hand-crafted route was the one we wanted to take intentionally. 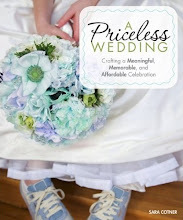 In some cases, it allowed us to make our wedding special with sincerity rather than money (like by embroidering our life story along the bottom of my $15 dress). In other ways it helped us save money (like by making our invitation postcards out of supplies we had in our craft closet and making our own ceremony program fans). 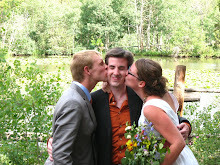 It also helped us lessen our impact on the environment (like by making Matt's tie out of an old dress of mine). 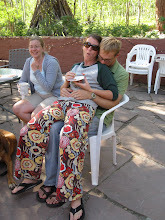 And, at times, it started to drive us insane (like making enough cloth napkins for our Welcome Picnic and our Wedding Reception). I also noticed that we started to take on more and more unnecessary projects as our engagement stretched on (like sewing flower pins for everyone in the wedding party). 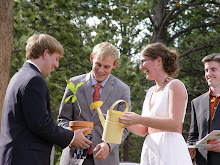 Overall, however, DIYing many aspects of our wedding was an important part of our process. It brought us closer to our wedding. It allowed us to share ourselves with our nearest and dearest. Even for those of us who find meaning and purpose through the process of making things, there can be a fine line between crafting and losing one's marbles. Whenever I undertake a DIY project, I inevitably progress through the six stages from pure excitement to regret and frustration to sheer pride. There also comes a moment when I have to calibrate my ambition to the reality of my time/skills/ability. Take my most recent Picnic Placemat Project, for example. I had every intention of making eight of these for my friend's birthday. I figured eight was a good set. I tried to buy enough fabric for all eight placemats, but after I was finished cutting, I realized I only had enough for four placemats (since it takes two pieces to make each one). Oh well. I decided to go with Plan B. I figured four would make a sufficient and satisfactory set as well. But then I actually started sewing them. Although each one didn't take too long, it was Friday night and I was tired. Her party was the next day. That's when I had to come up with Plan C: Make two placemats instead. And you know what? Two were perfectly fine. Because, at the end of the handmade day, it truly is the thought that counts. Matt and I had to apply the same "Plan B Philosophy" to our DIY wedding projects, too. When the thought of sewing more than 80 napkins threatened to drown us, we decided to trim the edges with pinking sheers instead. When the prospect of hemming our sheets-as-tablecloths was about to break us, we opted to fold them under. At the end of the day, we each have to find our own balance between hand-crafting, maintaining our sanity, and saving money. There's no easy answer, but the questions are definitely worth asking. This is a very good discussion, Sara. I don't think I've seen many posts that talk about weighing the cons and pros of DIY. I'm not a DIY Queen- I can't use a sewing machine, but I do love my hot glue gun. So I refer to our wedding as the lazy-DIY. We're only doing projects we are confident in doing- by spending time, money or patience. My fiance is a graphic designer and he was very excited to build our website, save the dates and invites. I'm more of a re-purposing gal (using old things for something else) than an actual project doer who makes new things. So the DIY projects I am doing- bunting, chalkboard, centerpieces, I've enlisted the help of friends. I used to feel REALLY guilty about not DIY'ing everything in my life, but I quickly learned there were others out there like me. Plus, just because I can't sew doesn't mean I'm not good at anything. Shoot. I bought two beautiful dish napkins on sale at Anthro, laid them next to each other and now I have a beautiful kitchen table runner! Haha! cute table cloths! any plans to sell them on etsy? 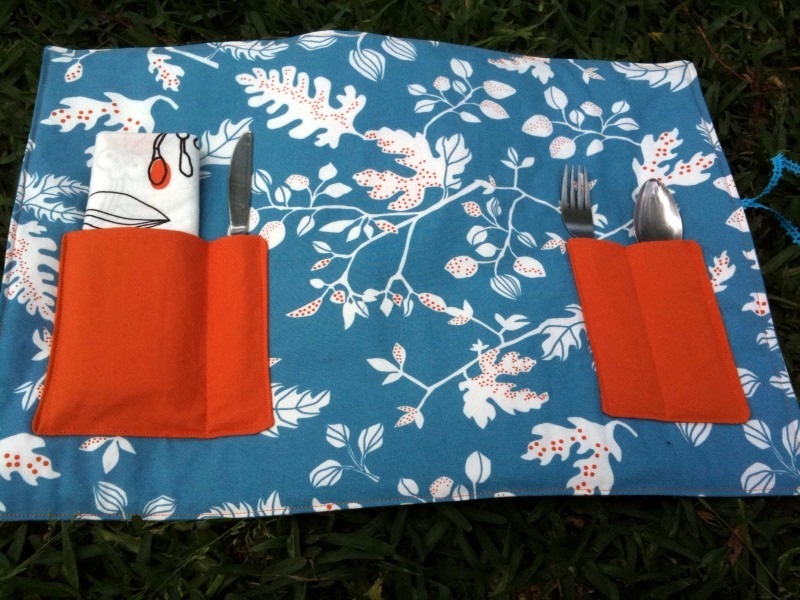 I'd love to hear any advice you have about DIY napkins; we're tackling this project, too! We made our save the dates and got SO many compliments on them that I got high of DIY (hey! that rhymes!) and was like, "I'M GOING TO BUY A GOCCO AND MAKE OUR INVITATIONS! ".....yeaa.....with working full time and finishing up a certification program to switch careers there was no way in hell I was taking on that project. We've still got a few DIY projects, but for the most part I'm outsourcing in order to keep my sanity. but i am tempted now to make some picnic placemats....those are amazing. Man I almost feel bad at time looking back on my wedding that was 8 months ago thinking I should have done more DYI things. I am a super crafty creative person but I didn’t want to be stressed with trying to plan all the DYIing, the other wedding details, and then our month long honeymoon all over Europe. In retrospect I think I would have done a little more but I’m still pretty happy with the DYIing we did do: our own flowers, invitations, centre pieces, signing book, and Guest chart. I know those are pretty standard things to do for your wedding but I loved my wedding and I’ll just DYI it up a lot on things around the house now with no time restraint and no worry of only a one time use. I just downgraded handmade napkins to fabric ties around rented napkins but with every intention of reusing the ties to make a quilt (so you can see I'm not totally sane yet. ha) later. The only thing I would add to this discussion is that if you and your helpers are not already pretty regular crafters, it might be hard to think of the plan B's once you start something. Be sure to ask around because one of your helpers might have a great and practical idea.